A cart system and method are provided, the cart capable of being converted to a table using only components of the cart, the cart including a base, four sides coupled to the base, and at least two wheels coupled to the base. In use, the cart is capable of being converted into a table and at least one seat, utilizing only components of the cart. Additionally, at least one of the wheels is utilized, at least in part, for the at least one seat. Let me introduce myself. My name is Greg Reed, I am a 57 year old engineer at a major Silicon Valley hospital in Santa Clara, California. A few years ago, while observing a large crowd garthering at a 4th of July celebration, I had an "Ah Hah" moment. The light bulb went on and the gears started turning. I have developed a never seen before device so unique, I spent the time and financial outlay to secure the patent. My product is called Convert-A-Cart. It converts either a 2 wheeled or 4 wheeled cart into a table that seats 2 or 4 adults. THE CART IS UNIQUE BECAUSE NO TOOLS ARE NEEDED. It uses the existing parts of the cart/wagon to convert itself. The protoypes were handmade in a garage using 3/4 inch plywood and steel. They were built to prove that the idea works. The final manufactured product will most likely be made of aluminum and molded plastic and can be produced in a variety of sizes and colors. Whether you are interested in purchasing this patent, or developing a business relationship feel free to contact the marketing manager Gene Tomasco @ 503-539-5679 or email at [Use the button below to contact me]. You can also preview a short video presentation on Youtube listed as Convertacart. Thank you for your time, may the vision move forward. We are looking to build business together! 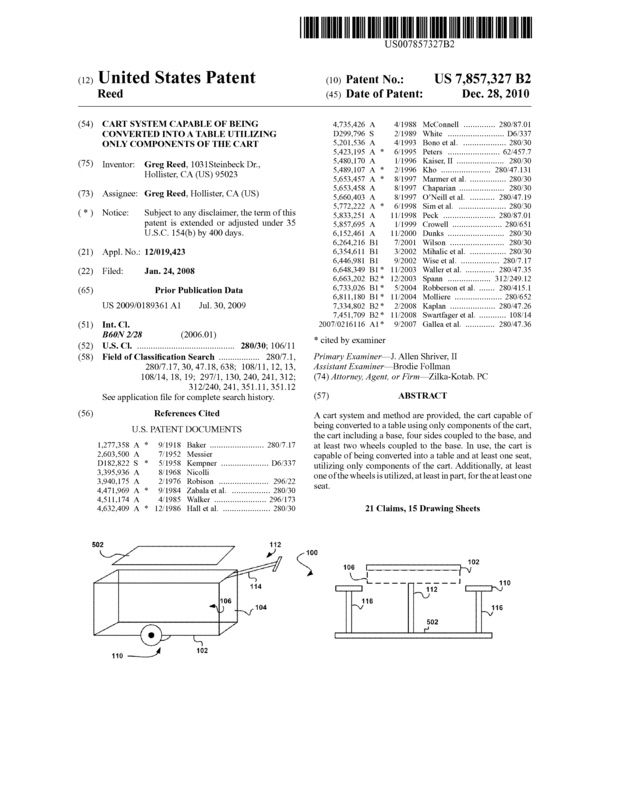 Page created at 2019-04-26 6:04:32, Patent Auction Time.